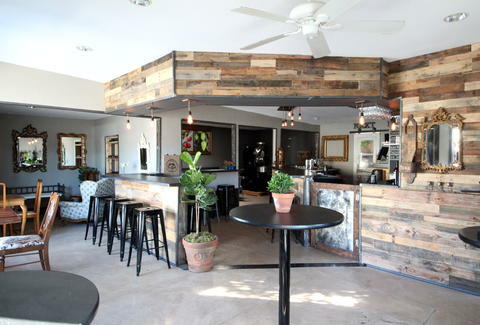 Aiming to compete with Miami in a vice competition, the couple behind La Mesa's Treehouse Coffee weren't content simply jump-starting your day, so when they saw the shop next door open up, they decided it was time to open up Next Door: a hyper-local wine bar they completely refurbished with ornately framed mirrors, tarnished metal accents, and wood re-purposed from coffee pallets left over from deliveries. In an attempt to rescue our state's struggling economy, they're only slinging vino from CA vines including Chronic Cellars Purple Paradise and Michael David 6th Sense, which counter-intuitively won't leave a bitter taste in your mouth. And for staying power, they're serving a light menu with snackables like charcuterie and carrot top pesto, a trio of flatbreads (including one with shiitake mushrooms, roasted butternut squash, gruyere & sage), and even Sunday brunch with savory bread pudding, sopressata, cheddar & egg, plus croissant French toast with toasted almonds & center-cut bacon, also what point guards yell at Kevin during pick up basketball games. In case someone in SD drinks beer, they've got eight, frequently rotating taps (and plans to add a cask before the grand opening) sticking to all-CA suds like Black Market Bavarian Hefeweizen, Pete's Tribute Brown from Bear Republic, and an Eaglerock Pupulist IPA that only comes in 22's, something Sonny refused to carry, lest he end up Miami (V)iced.